With all of the great baby shower decoration ideas available for unique baby shower themes and our many selections to choose from, you are sure to find exactly what you want. Find Fun and Simple ideas on how to incorporate your shower favors into baby shower table decorations, centerpieces and tableware ... making clean-up a breeze! When deciding on baby shower decoration ideas, remember to Keep It Simple. Sometimes just a simple ‘sprinkle’ of decorations centered around the baby shower cake is perfect. Keep from going overboard by remembering that the focus should be on Mom-To-Be. If Mom-To-Be is a more festive, decorating type then sure, hang some simple streamers and balloons. And if children are invited, this also makes it fun and lively for them. In addition to the excellent ideas listed below, we also have gender specific collections. Visit our Little Girl Baby Shower Decorations and our Baby Boy Shower Decorations. Is Mom-To-Be due in the Summer months? If so, we have lots of sizzlin' summer decoration ideas at our Baby Shower Summer Splash Pool Party Supplies and Decorations. Looking for other seasonal and holiday baby shower theme and decoration ideas? Visit our Unique Baby Shower Themes page. From "Fairytale", "Candyland" to "Goth", think about your theme and just how themey you want the baby shower decorations to be. Look to Mom-To-Be for baby shower decoration guidance, and just how much, or how little, she'd like to have at her shower. Cut flowers always add a fresh touch and aroma. Get some floral decoration ideas from our Send Flowers page. Decorated baby food jars with votive candles inside. Or, buy them already made on our Baby Shower Candles page. Here's another fun candle idea. These personalized shot glass votive holders will light up your guests eyes and make awesome decorations as well as baby shower favors! Use blue or pink pacifiers, teething rings or baby keys for napkin rings. Decorate with confetti and/or candy in the shape of pacifiers, baby pins, baby carriages table sprinkles or shapes that coordinate with your theme sprinkled about. A baby shower diaper cake makes a great centerpiece as well as the perfect gift to get Mom-To-Be starter supplies. Panda Bears, or your favorite stuffed animal, with attached balloons are such a cute way to decorate. Choose from these adorable designed helium balloons. These darling stuffed animals also look irresistible with cut flowers attached and make very cute baby shower table decorations. Select a variety to decorate and warm up the room. This is a great idea. Use an inexpensive baby bath tub as a punch bowl. 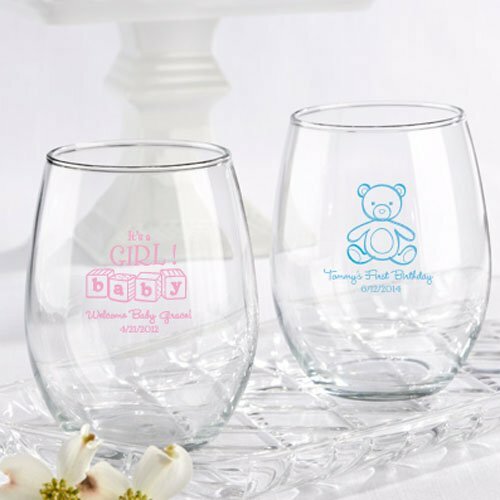 Pair it up with these personalized stemless glasses to serve your punch and as an elegant baby shower favor. 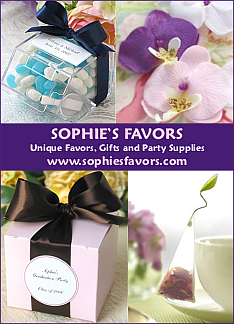 Tips: Use your favors as baby shower decorations and invite your guests to take one as they leave. Shower favors, prizes, cupcakes, cookies and candy all make great baby shower decorations for your unique baby shower theme ... and it's easy clean-up! 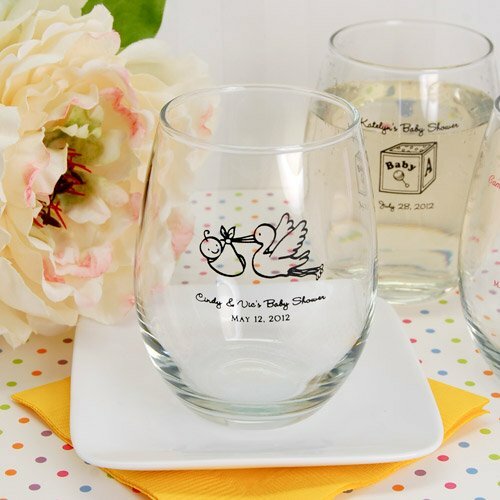 Find more ideas for decorations at our Baby Shower Favor Ideas. Trendy Ideas & Cute Supplies! Be Delighted To Take Home!